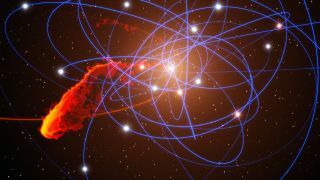 A computer simulation shows the G2 gas cloud's encounter with the supermassive black hole Sagittarius A* at the center of the Milky Way, as well as the paths of the many other objects that orbit the black hole. A mystery object at the center of the galaxy has astronomers scratching their heads, and a new piece of information won't be solving the case before the New Year. In yet another twist to a saga of astronomical proportions, astronomers now say a gas cloud called G1 made a tight orbit around the supermassive black hole at the center of the Milky Way galaxy 13 years ago. The object could be one in a series of gas clouds, the second of which may soon become a snack for the black hole. While the scientists at Max Planck contend that G2 is a gas cloud, a group of researchers at the University of California, Los Angeles, led by astrophysicist Andrea Ghez, argue that G2 is more likely a star surrounded by a layer of dust and gas. Over the summer, G2 made its closest approach to the black hole and was not torn apart. Ghez and her group argued that this was a knockout punch for the gas cloud theory — clear evidence that G2 is a solid body. Using a combination of simulation and high-resolution images, researchers at the Max Planck Institute concluded that the G1 object (blue) would have taken a path very similar to the G2 object (red) around the super massive black hole at the center of the Milky Way Galaxy (marked with an "x"). But the researchers at the Max Planck institute countered with an explanation for how G2 could have remained intact even if it is a gas cloud. Their theory incorporates the idea that G2 was once part of a larger gas cloud that subsequently broke up into smaller gas clouds that all follow the same path, like beads on a string. This "beading" of gas has been observed in the universe before. If additional clouds of gas could be identified following the same path as G2, that would strongly indicate that G2 is a gas cloud and not a star, the scientists say. In their newest paper, the Max Planck group provides a computer model that retraces the path of G1. According to their research, G1 followed a path nearly identical to G2. The model does make certain assumptions about G1's motion — for example, that it decelerated near closest approach to the black hole. "The good agreement of the model with the data renders the idea that G1 and G2 are part of the same gas streamer highly plausible," Stefan Gillessen, a co-author on the new research, said a statement. The new study was first published on the online preprint journal arXiv.org and has been accepted to the Astrophysical Journal. Editor's Note: This article was updated to correct the following error: the G1 object was first seen in 2004, and was not, as this article previously stated, "newly discovered."